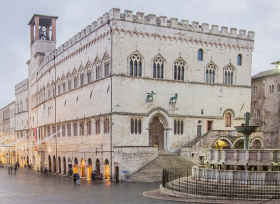 Palazzo dei Priori, a superb expression of the city's municipal spirit, was built between the 13th and the 15th centuries. Its austere mass, completely closed in a vest of square stone and only slightly embellished by two rows of beautiful Gothic windows with three lights which run along its longer side, stands on the square like an enormous bastion. The Palace is contrasted by the gray and roughly-hewn lateral walls of the Cathedral, which is situated directly in front of its high stairway, and where you'll find the great bronze staue of Pope Julius III, ercted in 1555 by grateful Perugians. The Palace is adorned by a portal similar to that of a Cathedral on the side which opens on Corso Vannucci. From this portal, one enters the National Gallery of Umbria, which contains Umbria's most important collection of paintings. In its many rooms rare works of art and paintings by Perugino, the artist who with his purity of design and sensitivity to the use of colour has given us the most happy expression of the grace and the sweetness of Umbria.